First of all, thank you to everyone for the amazing comments and the support you’ve shown me both here on the blog and in private. It means so much to me. I have been working like a dog – 11 straight days of shooting – so there hasn’t been much time for cooking here at home. There is a light at the end of the tunnel for tomorrow is the last day. I am going to work on something really fresh and light and yummy for the end of the week. In the meantime, my latest article for AtlantaCuisine has been posted. This time, it’s about the current craze here in town for deviled eggs. You can learn how to cook the perfect deviled egg and then use your skillz to make my recipe for BLT Deviled Eggs, complete with Bacon Salt and all! Love deviled eggs, though I never can get them to look so pretty. Nice food-styling skillz! Don’t know if you’re still on the hunt but I make my deviled eggs with homemade serrano mayonnaise and finely diced Benton’s Bacon. Seems to fit in with your bacon “wah” while at the same time, adding a bit of “punch”. Keep up the good werks! You’re totally my favorite food celebrity. For years I’ve had a bit of an aversion to deviled eggs . . . not sure why . . . but I’d eat these if you made them for me. Do they ship well? Love the play on a BLT. Nicely done! 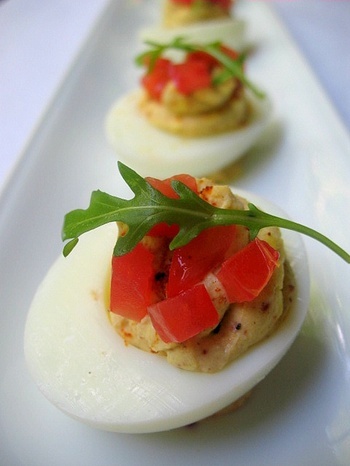 I love deviled eggs, but never want to make them. The thought of having to peel all those egg shells is too much. Perhaps your post will motivate me to just get over my laziness!